1. Research paper on Evaluation of Antibiotic Prescribing in Kabul, Afghanistan is published in EJIM with impact factor 2.9. The paper is a joint work of KU faculty members. 2. A joint research conducted by Kateb Medical Research Center and Kirmanshah Medical University (Iran) is published in Asian Pacific Journal of Cancer Prevention with impact factor 2/52. 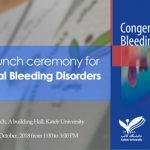 Kateb University congratulates and thanks the KU Medical Research Department board member for bringing this achievement to Kateb University.